Background: Smithia conferta Sm. is an annual herb widely used in Indian traditional medical practice and commonly known as “Lakshman booti” in Sanskrit. Morphological resemblance among the species of genus Smithia Aiton. leads to inaccurate identification and adulteration. This causes inconsistent therapeutic effects and also affects the quality of herbal medicine. Aim: This study aimed to generate potential barcode for authentication of S. conferta and its adulterants through DNA barcoding technique. 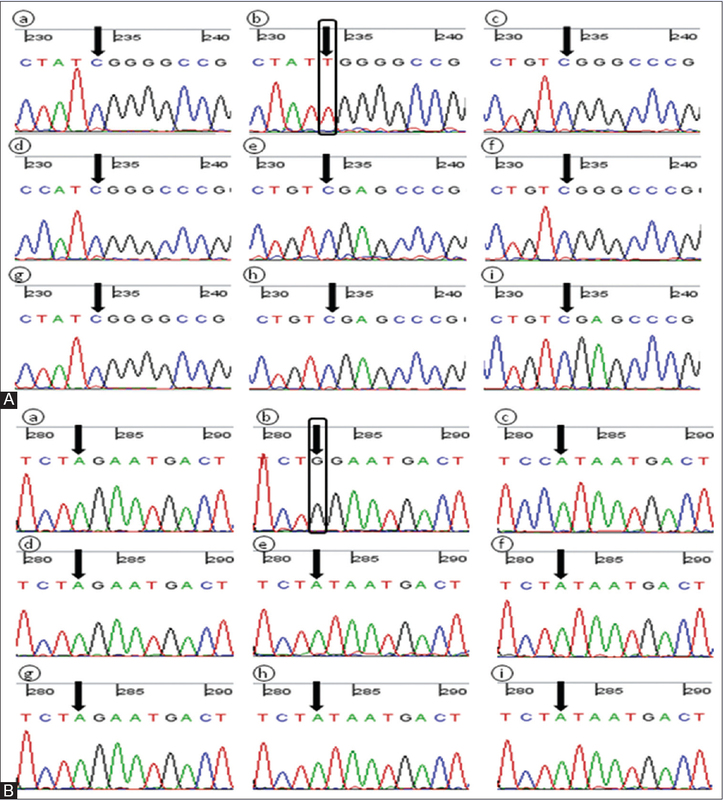 Materials and Methods: Genomic DNA extracted from S. conferta and its adulterants was used as templates for polymerase chain reaction amplification of the barcoding regions. The amplicons were directed for sequencing, and species identification was conducted using BLASTn and unweighted pair-group method with arithmetic mean trees. In addition, the secondary structures of internal transcribed spacer (ITS) 2 region were predicted. Results: The nucleotide sequence of ITS provides species-specific single nucleotide polymorphisms and sequence divergence (22%) than psbA-trnH (10.9%) and rbcL (3.1%) sequences. The ITS barcode indicates that S. conferta and Smithia sensitiva are closely related compared to other species. Conclusion: ITS is the most applicable barcode for molecular authentication of S. conferta, and further chloroplast barcodes should be tested for phylogenetic analysis of genus Smithia. Abbreviations used: BLASTn: Basic Local Alignment Search Tool for Nucleotide; MEGA: Molecular Evolutionary Genetic Analysis; EMBL: European Molecular Biology Laboratory; psbA-trnH: Photosystem II protein D1- stuctural RNA: His tRNA gene; rbcL: Ribulose 1,5 bi-phosphate carboxylase/ oxygenase large subunit gene. The present investigation is the first effort of utilization of DNA barcode for molecular authentication of S. conferta and its adulterants. Also, this study expanded the application of the ITS2 sequence data in the authentication. The ITS has been proved as a potential and reliable candidate barcode for the authentication of S. conferta. The genus Smithia (Fabaceae) is widely distributed in temperate and tropical regions of the Old World consisting of thirty species. It is represented by 18 species native to Indian subcontinent,, and of these, 11 are endemic to India. Smithia conferta Sm. is an annual herb used in Indian Pharmacopoeia as crude drug. It is commonly known as “Lakshman booti” in Sanskrit  and widely used in the traditional medical practice. The Lakshman booti is used in the treatment of biliousness, ulcer, rheumatism, laxative, tonic, uterine trouble such as gravel along with regulating fertility, and also in sterility problems in women.,,, The leaf powder mixed with honey was advised for treating cholera and its ointment is used to cure elephantiasis., It is also used to remove the effects of old age and wrinkles. The morphological resemblance among the species of genus Smithia Aiton. leads to inaccurate identification and adulteration. This causes inconsistent therapeutic effects and also affects the quality of herbal medicine. Raising its demand in traditional and folk medicines consequently, issues such as substitution, adulteration, and low-quality products create bottleneck toward authenticity. Therefore, there is an urgent need to develop a reliable and quick method for its identification. The DNA-based approach seems to be appropriate which provides a means of assessing the accuracy of the taxonomic treatment. The multi-locus approach based on the chloroplast and nuclear genome has been proposed and accepted for barcoding of land plants., The choice of barcoding regions is very crucial task, but the DNA regions such as internal transcribed spacer (ITS), psb A-trn H, and rbc L are suggested and proposed for constructing phylogeny and authentication of medicinal plants.,, The aim of the present study was to test the discrimination power of these barcodes and establish reference database to facilitate future identification and authentication of S. conferta. A total of nine species of Smithia were collected from the Western Ghats of India. The plant material was identified, and voucher specimens have been deposited in the herbarium, Department of Botany, Shivaji University, Kolhapur, Maharashtra, India [Table 1]. Genomic DNA was extracted from dried leaves using cetyltrimethylammonium bromide method  with minor modifications. Polymerase chain reaction (PCR) amplification of three candidate DNA barcodes was carried out in an Eppendorf Master Cycler Pro (Eppendorf India Ltd., India) employing about 20 ng of genomic DNA as a template in 25 μl reaction mixture, which contains 1 × PCR buffer, 2.0 mM MgCl2, 0.2 mM of each dNTPs, 1 μM of each primer (Synthesized by Xcelris Labs Ltd., India), and 1.0 U of Taq DNA Polymerase (Fermentas, Thermo Fisher Scientific, India). We used three primer pairs corresponding to the barcode regions, namely, ITS (5 fwd-CCTTATCATTTAGAGGAAGGAG; 4rev-TCCTCCGCTTATTGATATGC), psb A-trn H (psb A fwd-GTTATGCATGAACGTAATGCTC; trn H rev-CGCGCATGGTGGATTCACAAATC), and rbc L (1 fwd-CCTATCCATCTGGAAATCTTAG; 724 rev-GCTACTGCAGGTACATGCGA). All the PCR products were purified with Axy Prep PCR Cleanup Kit (Axygen Scientific, USA). DNA sequencing was performed with Z-Big Dye Terminator Cycle Sequencing version 3 (Sci Genom Labs Pvt. Ltd., Kerala, India). Sequenced product was analyzed on automated ABI 3730XL analyzer (Sci Genom Labs Pvt. Ltd., Kerala, India) using forward primer. The low-quality sequences were subjected to re-sequencing. The sequences were analyzed with BLASTn of the National Centre for Biotechnology Information to confirm the identity of the samples (http://blast.ncbi.nlm.nih.gov). Raw sequence data were analyzed with the Ridom Trace Edit version 1.1.0 (Ridom GmbH, Germany). Sequences were preliminarily aligned with multiple sequence alignment tool ClustalX. The secondary structure of the ITS2 was predicted according to Koetschan et al. The ITS2 region was identified and delimited based on hidden Markov model which was performed through the web server (http://its2.bioapps). For authentication and assessment of relationships among the nine Smithia species, unweighted pair-group method with arithmetic mean (UPGMA)-based phylogenetic tree was constructed using MEGA6 software version 6.0.6. The genetic distances were calculated using Kimura 2-parameter distance model. The bootstrap test with 1000 replicates was applied to assess the reliability of phylogenetic trees. The efficiency of the PCR amplification of ITS, psb A-trn H, and rbc L regions was 100%, and all the three candidate DNA regions were successfully sequenced. Sequences were submitted to the GenBank database (EMBL) and their accession numbers were listed in [Table 1]. The DNA sequences of the ITS regions among S. conferta and its adulterants were highly conservative. The sequence length varied from 676 to 678 bases, and aligned length was 681 bp [Table 2]. Out of which, 529 (77.6%) were constant, 100 (14.6%) were parsimony informative, and 150 (22%) were variable sites. Two single nucleotide polymorphisms (SNPs) specific to S. conferta were detected at the aligned positions of 234 (C → T) and 283 (A → G) [Figure 1]. 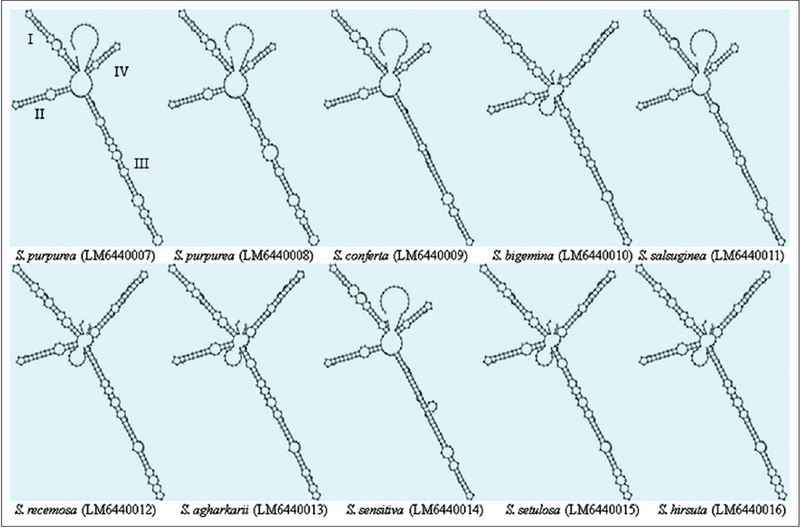 The sequences of S. conferta and Smithia sensitiva were identical at aligned positions 49 (T), 122 (C), 165 (C), 173 (T), and 210 (C) but showed SNPs when compared with other Smithia species. The nucleotide frequency of G + C (56%) was observed in S. conferta and S. sensitiva. Based on these SNPs, S. conferta and its adulterant species were differentiated. The interspecific divergence between S. conferta and other Smithia species varied from 9.3% to 13.5%, with an average interspecific distance of 8.4%. Together with other species of genus Smithia, the UPGMA tree based on Kimura 2-parameter model of ITS sequence data accurately discriminated S. conferta and its adulterants with high bootstrap support [Figure 2]a. The sequence variations of psb A-trn H among S. conferta and other Smithia species varied from 1.4% to 7.6%, with an average interspecific distance of 4.8%. The sequence length varied from 338 bp to 354 bp, with aligned length of 356 bp and 10.9% nucleotide divergence. The remarkable nucleotide frequency of G + C (32%) was found in S. conferta. Within psb A-trn H, 39 (10.9%) sites were variable, 309 (86.8%) were conserved, 13 (3.6%) were singleton, and 26 (7.3%) were parsimony informative. Among the aligned sequences, two SNPs at 238 (A → G) and 286 (T → G) were found specific to S. conferta. Results revealed unique 6 bp insertion (ATTTTT) between 44th and 49th positions. S. conferta is distinctly recognized from its adulterant Smithia species in UPGMA tree based on Kimura 2-parameter model [Figure 2]b. The DNA sequences of rbc L region of S. conferta and its adulterants were not showed much variation than the ITS and psb A-trn H regions. The identical sequences were observed in S. conferta and S. sensitiva. Four SNPs, 186 (C → T), 388 (C → T), 634 (A → C), and 649 (G → A), specific to S. conferta and S. sensitiva were detected at the aligned sequences of rbc L, and the sequence length was 705 bases [Table 2]. Out of which, 683 (96.8%) were constant, 13 (1.8%) were parsimony informative, 9 (1.2%) were singleton, and only 22 (3.1%) were variable sites. Very low sequence divergence (1.1%–1.8%) was observed among S. conferta and its adulterants with an average interspecific distance of 1.1%. The nucleotide frequency of G + C (42%) was reported in S. conferta [Table 2]. Remarkably, no single insertion or deletion was observed in all species under investigation. According to the UPGMA tree based on Kimura 2-parameter model, S. conferta and its adulterants were placed in two different clusters with high bootstrap support and differentiated from S. sensitiva by least SNPs [Figure 2]c. The rbc L sequence data were unable to distinguish S. conferta from its adulterant Smithia species. For authentication of Smithia species, we focused not only on the divergence of the sequences of nuclear ITS region, but also used variations in the secondary structures of ITS2. All the Smithia species had a typical 4-helix folding structure, a central ring, and four similar helices: Helices I, II, III, and IV. Moreover, helix III was longer than other helices [Figure 3]. It revealed that their variation was mainly present in helices I, III, and IV in ITS2 secondary structure. The helix II was most stable and showed pyrimidine-pyrimidine base pairs. The secondary structure of S. conferta shows that helices I and II were different from the others and the secondary structure of S. sensitiva is close to S. conferta, but it can still distinguish them at helix IV. Thus, we can distinguish S. conferta from its adulterants by comparing ITS2 secondary structures. Traditionally, S. conferta is used in Ayurveda and has reported a wide range of biological activities, namely, laxative, diuretic, antifungal, antimicrobial, anti-inflammatory, antirheumatic, tonic, antibilious, headache, ulcers, reduces wrinkles, reduces sterility problems in women, and stimulates central nervous system. Similarly, the worm leaf paste is used to reduce bodyache. Pullaiah and Naidu  reported antidiabetic activity of S. conferta. Furthermore, rendering the authentication of Smithia species based on morphological methods is very difficult. In recent years, adulteration of medicinal plant species is a matter of discussion in drug discovery, which ultimately leads to serious health implications. Therefore, it becomes priority to distinguish adulterants in plant samples. Recently, DNA barcoding approach attracted worldwide attention with promises to aid in the authentication and scrutinization of species relationships.,, Here, three DNA barcoding regions, namely, ITS, psb A-trn H, and rbc L were evaluated for authentication of S. conferta. The present study for the first time established DNA barcodes for identification and authentication of Smithia species. The present barcoding investigation accounts for 100% amplification and sequencing efficiencies. 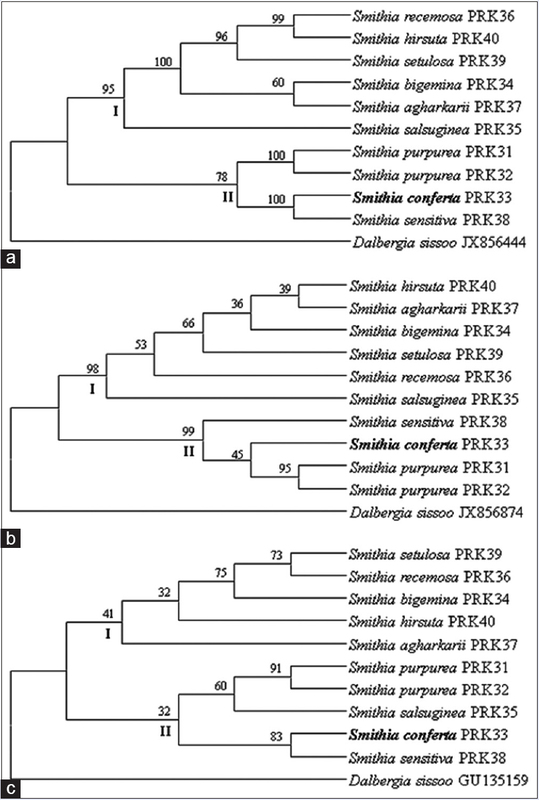 The data obtained from the variable sequence sites and deletions/insertions facilitated the identification of Smithia species based on ITS, psb A-trn H, and rbc L sequences. The psb A-trn H is the most widely used barcode in species discrimination due to higher rate of indels. In the present study, unique indels were observed in S. conferta. However, indels are common and often more common than SNPs which is a limitation of psb A-trn H. Although rbc L offers high universality, good PCR amplification, and sequencing, it was demonstrated to have insufficient sequence variation to distinguish closely related species. In this study, the lowest sequence divergence was observed in rbc L sequence data. The discriminating power of plastid regions was significantly lower than the nuclear region (ITS) because of slow rate of evolution.,, Results showed that ITS is one of the most appropriate and suitable barcodes with highest discrimination potential. Similarly, a previous study on authentication of medicinal plants also proved that ITS region has the potential as universal barcode.,,,, In the present study, it was reported that ITS sequences of S. conferta and S. sensitiva are identical except unique SNPs in S. conferta. S. conferta is an unique medicinal plant according to Indian Pharmacopeia, and S. sensitiva, Smithia hirsuta, Smithia racemosa, and Smithia setulosa are used as adulterants., Based on DNA barcoding studies, it is appropriate to treat S. conferta and S. sensitiva as a distinct species. 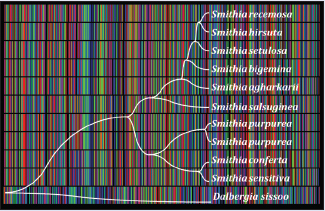 In the present investigation, the precise and standard DNA barcodes were proposed for the authentication of Smithia species. The current investigation is the first effort of utilization of DNA barcode for molecular authentication of S. conferta and its adulterants. Furthermore, this study expanded the application of the ITS2 sequence data in the authentication of medicinal plant research. Several studies used DNA barcoding methods to identify Indian medicinal plants, such as Swertia L. and Sida L. In addition, they had verified the utilization of ITS sequence for the authentication of herbal medicinal plants. The ITS region provides enough variability over psb A-trn H and rbc L for authentication of S. conferta and its adulterants. This study provided a scientific approach, based on DNA barcoding, to accurately and rapidly identify Smithia species. The ITS has been proved as a potential and reliable candidate barcode for the authentication of S. conferta and its adulterants. The present findings also suggest that further chloroplast barcodes should be tested for phylogenetic analysis of genus Smithia. The authors are grateful to Head, Department of Botany, Shivaji University, Kolhapur, India, for providing necessary laboratory facilities. Kumar S, Sane PV. Legumes of South Asia: A Check-List. Kew, UK: Royal Botanic Gardens; 2003. p. 243. Yadav SR, Sardesai MM. Flora of Kolhapur District. Kolhapur: Shivaji University, Kolhapur; 2002. Chopra RN, Nayar SL, Chopra IC. Glossary of Indian Medical Plants. New Delhi: Council of Scientific and Industrial Research; 1956. p. 228-9. Yadava RN. Novel biologically active flavonoidal constituent from Smithia by RN yadava Smithia conferta 1, 2 (N. O. Leguminosae ) is commonly known as Lakshman booti. Glossary of Indian Medicinal Plants. New Delhi: CSIR Publication; 1956. p. 228-9. Mobr TJ, Markban KR, Thomas MB. The Systematic Identification of Flavonoids. New York: Springer; 1970. p. 354. Lal D, Lata K. Plants used by the bhat community for regulating fertility. Econ Bot 1980;34:273-5. Begum NA, Chaudhary DN, Banerji J, Das BP. Studies on a carbazole alkaloid from Murraya koenigii spreng. and flavonoids from Pongamia glabra Vent. J Indian Chem Soc 2005;82:165-71. Agarwal R, Garg HK, Garg U, Singh SK. Anti-ulcer activity of Smithia conferta in various animal. J Saudi Chem Soc 2010;14:307-10. Linuma M, Mosayoshi O, Toshiyuki T, Mizuo M, Lang FA. Two C-Methylated flavonoid glycosides from the roots of Sophora leachiana . J Nat Prod 1991;54:1144-6. Yadava RN. Novel biologically active flavonoidal constituent from Smithia conferta Sm. In: Harper J, An M, Wu H, Kent JH, editors. Proceedings of the Fourth World Congress on Allelopathy. International Allelopathy Society. Wagga Wagga, NSW, Australia: The Regional Institute Ltd., Gosford, NSW 2250, Charles Sturt University; 2005. p. 21-6. Kress WJ, Erickson DL. A two-locus global DNA barcode for land plants: The coding rbcL gene complements the non-coding trnH-psbA spacer region. PLoS One 2007;2:e508. China Plant BOL Group. Comparative analysis of a large dataset indicates that internal transcribed spacer (ITS) should be incorporated into the core barcode for seed plants. China Plant Bol Group 2011;108:19641-6. Newmaster SG, Fazekas AJ, Ragupathy S. DNA barcoding in land plants: Evaluation of rbc L in a multigene tiered approach. Can J Bot 2006;84:335-41. Kshirsagar PR, Umdale SD, Chavan JJ, Gaikwad NB. Molecular authentication of medicinal plant, Swertia chirayita and its adulterant species. Proc Natl Acad Sci India Sect B Biol Sci 2017;87:101-7. DOI 10.1007/s40011-015-0556-3. Doyle JJ, Doyle JL. A rapid DNA isolation procedure for small quantities of fresh leaf tissue. Phytochem Bull 1987;19:11-5. Koetschan C, Förster F, Keller A, Schleicher T, Ruderisch B, Schwarz R, et al. The ITS2 database III – Sequences and structures for phylogeny. Nucleic Acids Res 2010;38:D275-9. Quattrocchi U. CRC World Dictionary of Medicinal and Poisonous Plants. NW, USA: CRC Press, Taylor and Francis Group; 2012. p. 3473. Pullaiah T, Naidu KC. Antidiabetic plants in India and herbal based antidiabetic research. New Delhi, India: Regency Publications; 2003. Bruni I, De Mattia F, Galimberti A, Galasso G, Banfi E, Casiraghi M, et al. Identification of poisonous plants by DNA barcoding approach. Int J Legal Med 2010;124:595-603. Hebert PD, Gregory TR. The promise of DNA barcoding for taxonomy. Syst Biol 2005;54:852-9. Lahaye R, van der Bank M, Bogarin D, Warner J, Pupulin F, Gigot G, et al. DNA barcoding the floras of biodiversity hotspots. Proc Natl Acad Sci U S A 2008;105:2923-8. Gao T, Yao H, Song J, Liu C, Zhu Y, Ma X, et al. Identification of medicinal plants in the family Fabaceae using a potential DNA barcode ITS2. J Ethnopharmacol 2010;130:116-21. Zhou J, Wang W, Liu M, Liu Z. Molecular authentication of the traditional medicinal plant Peucedanum praeruptorum and its substitutes and adulterants by DNA – Barcoding technique. Pharmacogn Mag 2014;10:385-90. Coutinho Moraes DF, Still DW, Lum MR, Hirsch AM. DNA-Based authentication of botanicals and plant-derived dietary supplements: Where have we been and where are we going? Planta Med 2015;81:687-95. Santhosh Kumar JU, Krishna V, Seethapathy GS. DNA barcoding to assess species adulteration in raw drug trade of “Bala” (genus: Sida L.) herbal products in South India. Biochem Syst Ecol 2015;61:501-9.